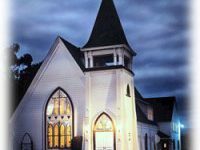 he Christian Church (Disciples of Christ) of Pacific Grove was organized as a congregation on April 22, 1894 by a small group of Christian women from Pacific Grove who had been members of the Christian Church in other places. They began a building fund for a church by sewing and doing fancy work which they sold to their neighbors, and soon they had the necessary $500.00 it would cost to build the church sanctuary, which was erected by the men of the church in 1895. They also called their first pastor, J. C. Keith, who was an evangelist. Early decor in the church included a pot-bellied stove in the corner by the organ, the pulpit which is still in use, and rung-backed chairs. And organ was added soon, which still rests in our Fellowship Hall. The pews of the church were added around 1900, purchased from an older church sanctuary. We do not know their origin, but do know that they are older than our building — maybe by fifty years or more. Many years ago, one of our members, Iris Bingham, furnished the pew pads — from proceeds earned from her invention of that hand-held slotted potato peeler you have in the kitchen drawer. The Fellowship Hall was added to the church building in 1911, which included a kitchen, and four classrooms upstairs. A former classroom — later a storage room — located over the chancel, is now restored as a Victorian Sitting Room enjoyed by many brides-to-be. The Perry W. Swann building was constructed in 1960, and houses our Nursery, classrooms and church offices. In 1974, the congregation completed a major restoration project in the Sanctuary, returning it to Victorian style after several remodeling changes. New windows were installed, created by a local artist after much research into Victorian art glass. New lighting fixtures were installed, the Chancel was restyled with a railing, and a new lectern was created to match the original pulpit. In 1999, the church installed their 39th pastor, Daniel Wm. Paul, MDiv. The church building stands today as a reminder of the ongoing ministry of the Christian people in Pacific Grove and California since the days of the Gold Rush. Stop by to visit our building. We would love to give you a tour.